Need them Fast? Let me know. 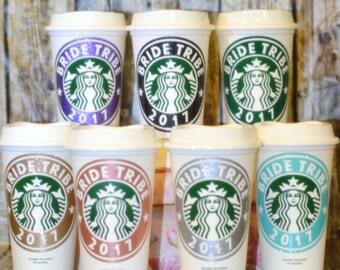 Genuine Starbucks® Reusable Cup that I personalize with a name. Each item is placed in a cello bag and wrapped as a quality gift for the entire wedding party. My normal production time is 4 weeks. Please plan around this and let me know if you need them sooner than the 4 weeks. All Bling Glitter colors are now included in the price! The new "Bling Glitter Purple" and "Bling Glitter Coral" are shown in the photos. Also, I just added a Bling Glitter Tiffany Blue. The Size is 16 oz. Grande Coffee Tumbler also called To Go Travel Mug. When you are placing the order you will be prompted for the Quantity, Year and Color. 1) Let me know your -Need By Date- these are needed by. 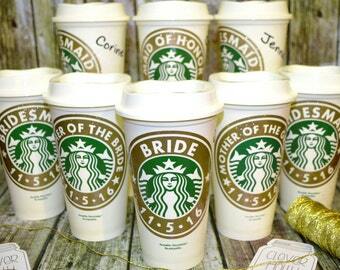 3) -Wedding Party Position- for each cup. Choose from the many colors listed... the colors shown are the bling glitter pink and bling glitter gold (the forest green color choice matches the Starbucks green color). Domestic shipping by Priority ★ Mail ★ | Canadian shipping by USPS First Class. Shipping, packaging and wrapping is automatically discounted on 2 or more items. 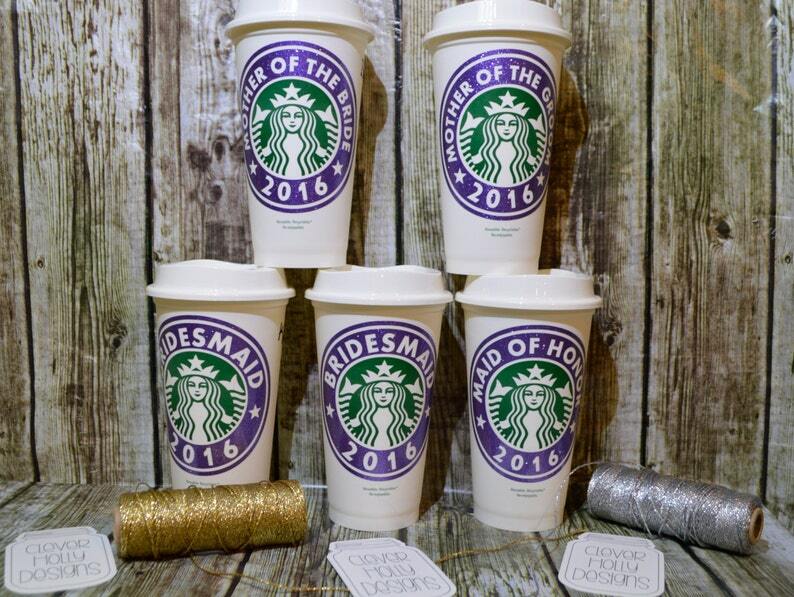 This personalized Starbucks Reusable Cup makes a great wedding party gift or appreciation gift for the whole wedding party or even the whole wedding as a favor. This great gift idea comes to you each packaged in a clear cello bag tied with twine. Please notice the quality of my design, my graphics are centered and I use the extra outer ring that others leave out. Also I use a nice font that is well spaced on the ring. These little extra things take more time and are hard to do right. 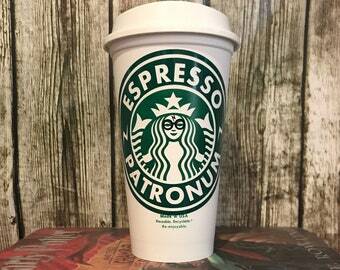 And as a bonus, because this is a genuine Starbucks Reusable Cup you get 10 cents off at Starbucks each time you use it! 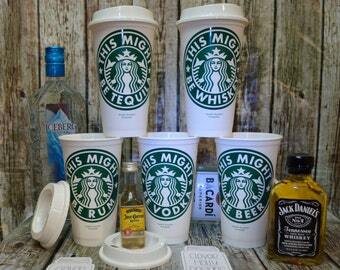 This is part of their Bring Your Own Mug (BYOM) program to help save trees. Hand washing recommended for long lasting enjoyment. The cups are marked "BPA free plastic and top shelf dishwasher safe". I tested over a 1/2 dozen TOP SHELF washings and the cup and vinyl decals held up fine. 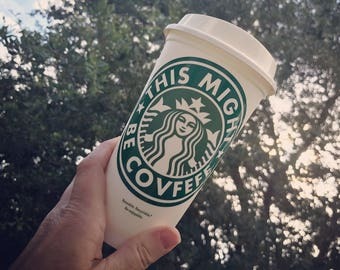 *This is a Genuine Starbucks® Reusable Cup that is currently sold in Starbucks Stores. 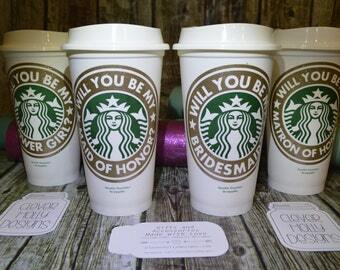 You are receiving the cup free and paying for my time and the personalized portion of the cup. Like my page and become a fan on Facebook! Came quickly and my maid of honor loved it. So happy with the Maid of Honour Starbucks mug, my sister loves it!! Never will her name be misspelt, haha. Orders shipped to Florida require a 6% state sales tax that is added to your order. Payment with my gift certificates will require that the "Other" option to be selected at check out. If there is a balance due after the certificate is used then then I will open a custom order for the balance. All items are hand made so I do not offer refunds however, I will redo any item that I have made a mistake on. I will also offer a discounted replacement if an item needs to be redone because of a customer ordering error. If a non-personalized Bodysuit or Onesie is the wrong size and it is returned to me in new resellable condition within 2 weeks, I will remake it in the correct size for the price of packaging and shipping. The total production time and shipping methods are specified in the item listings. Please convo me if you require any special arrangements, expedited processing or you want to schedule local pickup. Packaging and boxing fees as well as my travel time will still apply to any local pickups. If Etsy calculates the shipping date wrong (ie. they move a Sunday shipping date to the previous Friday) then please expect the shipping date to be corrected and moved appropriately to the following Monday. I do this for Saturday and Sunday shipping dates that Etsy changes to the previous Friday. During the major holidays or if I am out of town, I may briefly change my production times to 5-10 additional working days. I will always state any delays in the shop announcement at the top of the main page. Shipping discounts automatically apply for 2 or more items bought at the same time. On large orders I may offer additional shipping discounts. UK / EU: Additional charges that your governments may charge for tax (VAT, Customs Duty or Mail) will be paid by the buyer. Custom order requests that are not purchased will eventually expire. Please use the custom order within a reasonable amount of time to keep your production time slot.